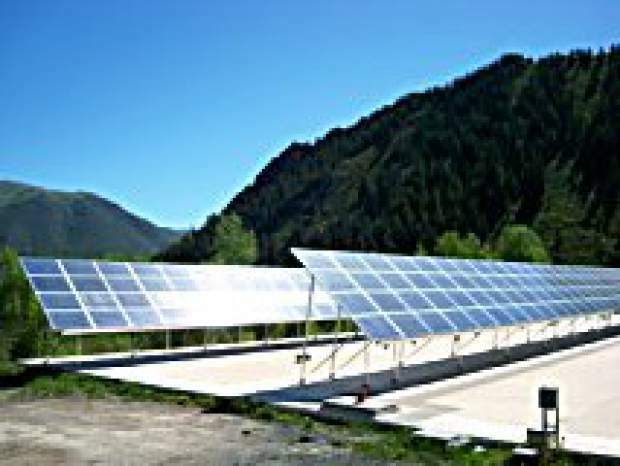 A grant from CORE helped install a solar system that helps supply power for the Aspen Waste Water Treatment Plant. The organization gives roughly $500,000 annually for projects at big buildings. Statistics for the Energy Smart Program in Pitkin County provided by CORE. The Community Office for Resource Efficiency will pass a milestone soon when it exceeds helping 1,000 homeowners in Pitkin County with retrofits that boost comfort and reduce energy bills. CORE has pumped more than $13 million into commercial and residential energy-efficiency projects through funds raised by its signature, innovative Renewable Energy Mitigation Program. This year, it will add roughly $1 million to its efficiency effort. The money is raised by the city of Aspen and Pitkin County by charging a fee to builders of new homes to offset their environmental impacts. Each home has an energy budget. If it exceeds that budget in ways such as installing snow melting driveways or outdoor pools, it must install a renewable-energy system onsite or pay a mitigation fee. CORE is celebrating its 20th anniversary this year, but it really wasn’t until 2000 — when the Renewable Energy Mitigation Program was created — that the organization soared. The fund transformed CORE from a feel-good organization that promoted energy efficiency to one with the financial clout to entice people to conserve. It helps administer the Energy Smart program, where homeowners and business operators can sign up for an energy assessment and receive a report on the big and small steps they can take to make their buildings more efficient. In Pitkin County alone, 994 homeowners have signed up for energy assessments between Jan. 1, 2011 and Dec. 31, 2013. Nearly all of them, 920, have undertaken some type of retrofits advised in the assessments, according to CORE’s data. Even though the funds are generated in Aspen and Pitkin County, elected officials of those governments have shared the benefits. They have expanded eligibility for use of grants and low-income loans throughout the Roaring Fork Valley. “That is our bread-and-butter program because it reaches so many people throughout the valley,” said Mona Newton, CORE’s executive director for the past two years. Homeowners and business operators pay $100 for the energy assessments, but they receive hundreds of dollars of immediate, simple-to-install efficiency boosters during the exam, Newton said. In addition, the staff of six full-time and two part-time workers helps clients determine what efficiency steps to undertake first and outline the rebates and grants available to them. The program obviously appeals to the Aspen area’s broad environmental base, but not everyone is convinced about climate change and the need to reduce carbon emissions from the burning of fossil fuels. CORE pitches efficiency to them from a financial standpoint. Money spent on home efficiency is a wise investment because it results in long-term savings on energy bills. “I think we’re starting to penetrate beyond the choir,” Newton said. The program also provides an economic shot in the arm by putting local contractors to work on efficiency projects. CORE estimates that contractors worked 12,295 hours on projects associated with the organization over the past three years. Newton and her staff reached a goal in late 2013 of providing an energy assessment on 10 percent of the homes in the Roaring Fork Valley. They aim to reach 20 percent of all households by 2020. Yet another program targets low-income households that cannot afford to undertake energy-efficiency steps. It does little good to know you have to increase the amount of insulation in your attic and that a rebate will cover the partial expense if you cannot afford it, Newton said. So CORE started a program last year where 20 low-income households were selected for grants for efficiency projects. Last year, CORE issued $470,000 in grants and $220,000 in rebates for everything from solar photovoltaic systems to energy-efficient refrigerators. There’s little danger of the agency workings itself out of a job. There are still a lot of valley homeowners who haven’t taken advantage of the programs, Newton noted. Plus, advances in efficiency standards create an endless need for retrofits. For example, LED lights have outdated technology that was state-of-the-art just eight years ago, Newton said, and programmable thermostats now are being replaced by smart models that learn residents’ use patterns and occupancy. “The low-hanging fruit grows back,” Newton said. For more on what CORE offers, visit its website at http://aspencore.org.